Scientists in Munich have presented their research on how the Earth’s oceans might look if not for its internal currents, tides and the weather. Are we a rotating potato? Check the link. Looking for Some Music to Stream while you go about your business? The Lightning in a Bottle Festival (see my POST from 2/27) just ended their MixTape competition, and 33 people submitted mixes. Basically the only requirements were that the mix could only include artists that were on the Line-Up for the Festival, and it had to be 30-60 minutes long. So… aside from the amazing MUSIC taking place at this 4 day festival on Memorial Day Weekend, there is also AMAZING ART! The folks running this festival just recently released the ARTIST LINE-UP for “Lightning in a Paintcan” (raising funds through a silent auction for the DoArt Foundation, a non-profit organization). 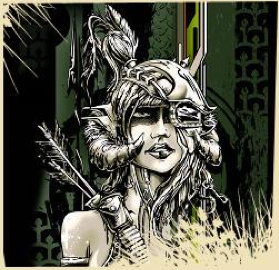 Here is a ScreenShot to give you a taste of the Phenomenal Artwork you can catch live at the Festival. 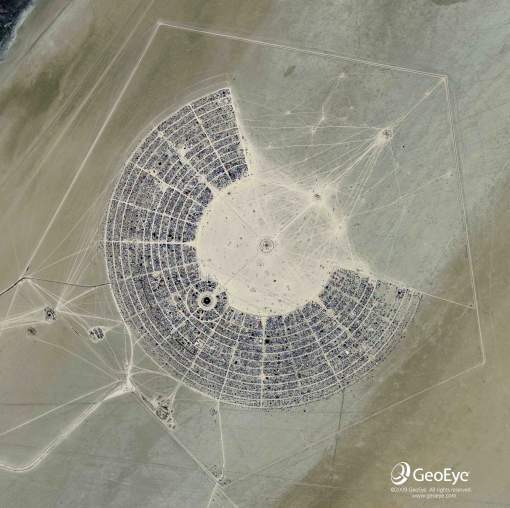 Now that I have locked down my tickets for Burning Man (see my post from January 31), the annual festival in Black Rock City, NV, and what I and at least 100,000 others humans consider to be the most creative event that humans have happening on this planet, it’s time to plan for another DOPE festival at the end of May: Lightning in a Bottle put on by the Do Lab crew from LA. And you KNOW the Ladies of KeepITight LOVE US some ART, MUSIC, & SUSTAINABILITY!!! Also this festival was recently awarded an *OUTSTANDING* Greener Festival Award! They had a stage last year at Coachella if you were there (see below). Anyway I went to LIB last year and camped out for 4 days. It was pretty much the most well-organized, enjoyable, and tree-shaded festival I have ever been to! They even had FREE WATER STATIONS available to everyone there. There were amazing artists, 3 excellent stages of glitch, dubstep, breaks, house and all kinds of tasty beats, including Middle Eastern Music, funk, and various electronica. Performers included: Nosaj Thing, Stephan Jacobs, MartyParty, Mimosa, Vibesquad, Lucent Dossier, Jupit3r, Daddy Kev & Nobody, Eliot Lipp, Heyoka, & Daedelus…. There were AMAZING artist painting live under the trees, as well as some of the coolest art installations and sculptures I have ever seen. The vendor’s section was amazing… oh and they had trapeze artists, belly dancers and fire-artists. They even had a HUGE (I’m talking 100s of feet) Earth Harp!! 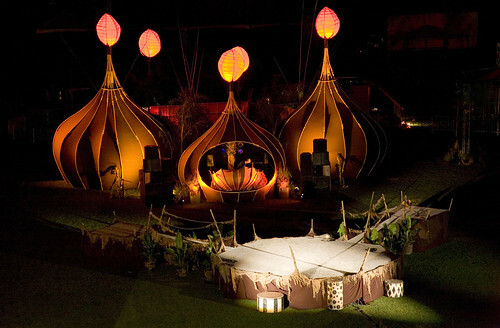 So tasteful and elegant too… It’s kind of like a smaller-scale version of Burning Man, but with Trees & Water! My favorite stop on the walk up the hill from the stages to the campgrounds was the huge TUB that my friends drove out there. It was sponsored by the grandson of Dr. Bronner’s soap (link) and featured Dr. Bronner’s minty foam soap and a rinse (about 15 foam tubes and 15 shower heads coming out of the walls of this massive Tub! Since it was the only shower for about 1000s of folks, it was a hotspot indeed! Anyway, check out the links. 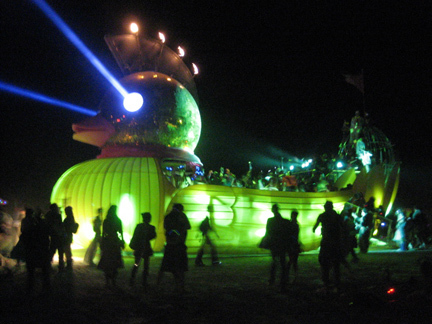 Lightning in a Bottle is May 28-30 and will be taking place about 30 minutes NorthEast of Laguna Beach in Cali. EARLY BIRD TICKETS GO ON SALE for 24 Hours ONLY on MONDAY, FEBRUARY 28 @7am! Scoop them UP (& don’t forget your Parking Pass)! You will NOT be disappointed. The music, art, art, installations, and just pure RAW culture will make your summer! Promise! If you haven’t seen the documentary, My Heart is a Drum Machine you have got to check it out. Here is the IMDB page. It is available on Netflix (under Documentaries) and was shown at the Phoenix Art Museum in 2009 . This flick looks at the idea that rhythm is the undercurrent to everything around us, and is like a fundamental language of the universe; also that our pulse, our heart, is beating steadily like a metronome or a drum machine! It features many well known musicians and artists talking about what music means to them. 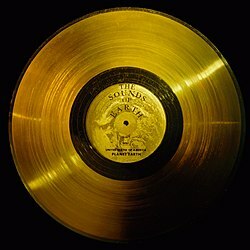 As a DJ, singer, and music-maker, this movie tugged at my heartstrings, but as a media scientist, and lover of space exploration facts, I was excited to find out there there is a set of golden LP records catching a ride on Voyager 1 and flying through outer space beyond our solar system . The Voyager 1 satellite was launched in 1977 and has been going strong for the past 34 years. It was built to last only 5 years. Actually, it just zoomed past Pluto recently into the outer shell called the “heliosheath” and is heading out of our solar system! On the website for this satellite, they are saying it should be sending data for another 10 years. What?!? First of all, this thing was build in the 70’s and it’s still ticking. Second, this satellite is millions of miles away and we can still communicate with it and get data? Those scientists definitely were long-term planners and severe geniuses. My favorite part of this whole thing? NASA is KEEPIN’ It TIGHT!!! …sending Turntables into Outer Space. If any other lifeforms come across the Voyager 1 (which happens to be the 3rd human artifact to leave our solar system), they will encounter a set of decks among the things that define humanity. I for one, am pleased! 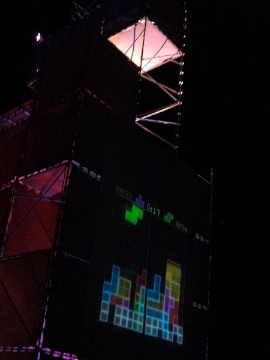 Although Coachella has become a mecca for music-lovers and a status symbol for music-makers, I tend to like the festivals that are considered more DIY, and where you might find the modern steam-punk variation of a cool carnie creating some of the most-cutting edge art technology [that probably glows and spits propane-powered fire!]. 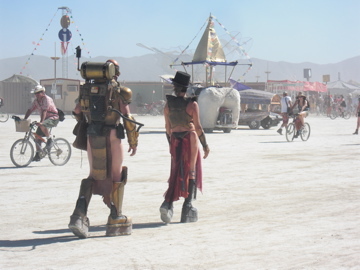 Two weeks ago, I spent a few hours waiting in a virtual “queue” for my Burning Man Festival tickets. Whether I go or not this year, I decided to buy my tickets early as the festival participants are multiplying exponentially each year. I miraculously scored a set of first-tier priced tickets @$210 each (plus fees), but not without some legal hacking. Tickets went live for Burning Man at 10am on Tuesday, January 19, and even though I had my browser set to refresh right when the clock hit 10am PST, I was still #2767 in line! The first three pricing tiers of 27,000 tickets sold out in 8 hours!!! There were major technical difficulties for all, which is understandable as there were like tens of 1000s of people all trying to hit the same site/server and refreshing it over and over. Things will get glitchy! 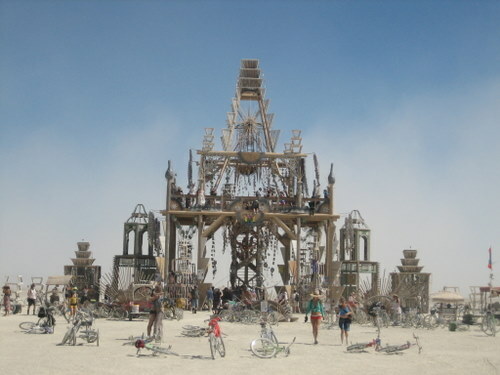 Considering that last year’s Burning Man festival had approximately 51,000 participants and for a week became the 5th largest city in the state of Nevada, this was not a suprise. Supposedly, the US government studies the logistics of how everyone manages to avoid total chaos and keep the peace. It’s pretty amazing! 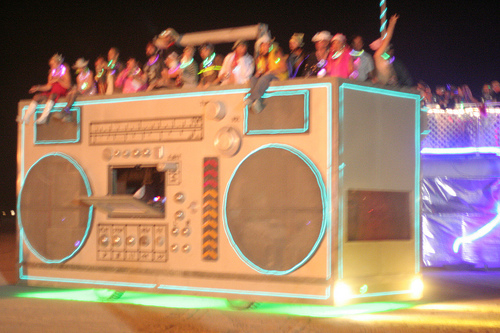 OK, so here is a little Burning Man history lesson. The first one was held in 1986 at Baker Beach in San Fran, in honor of the Summer Solstice. There were about 20 participants and they burned a “wooden man” that was about 8 feet tall, while playing music and partying. In 1990 with 800 participants in Baker Beach, burning is banned so they find a spot in the Nevada desert to “burn the Man” with about 90 participants there. After a few years, its popularity grew to where it eventually found a home in an ancient lake-bed about 3 hours northeast of Reno, NV. It is in the middle of NOWHERE! Like is said, this year there were 51,000 humans at their creative best that trek out to this event, while the man stood 104ft tall. The central temporary buildings with the most stories and detail tend to be “the Man” and the “Temple” (a place where you honor the sacred in all, where all religions and beliefs collide. 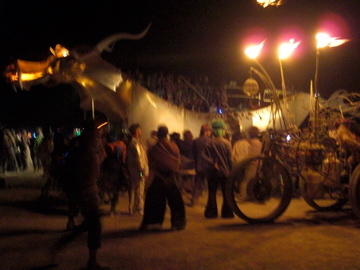 The Temple of Burning Man in 2008 - 3 stories, spiral staircases. Wow! Black Rock City has become mecca for large-scale, kinetic and interactive ART, creativity and technology in harsh conditions! 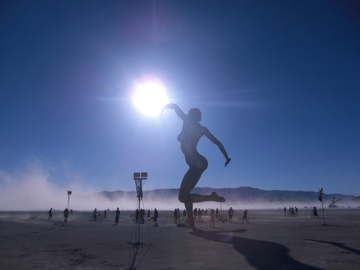 A lot of the art at Burning Man becomes large-scale Public Art in cities all over the globe! So, in conclusion, one of my favorite elements of the Burning Man family is the branch of philanthropy that has emerged from the festival. This year they donated $159,850 back to the community! Another arm of the organization is the Black Rock Arts Foundation, which funds community activist interactive art for local communities all over the world. They focus on Interactivity, Community, Education & Activism, four things we hold dear here at .keepItTight. ! 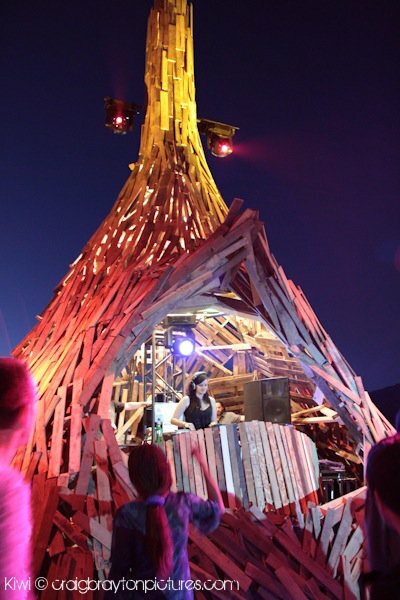 Although the BRAF Grant Cycle for the community art has passed, if you have an idea for some type of large-scale art to create in the Black Rock Desert, the Burning Man Festival Art Grant deadline is TOMORROW, FEBRUARY 1st! So I am finishing up MY grant app today (more on that in a future post). 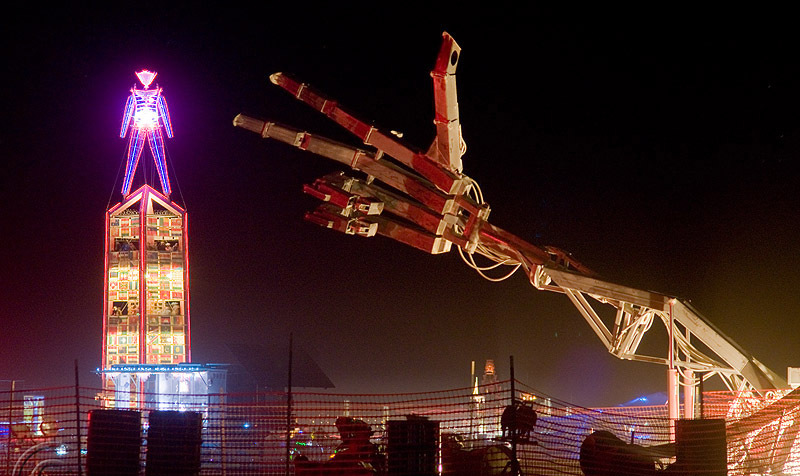 In the spirit of all the creative, large-scale, kinetic, fire-breathing, moving light sculpture ideas that are being submitted today to the planners behing the biggest festival on the planet, I as: What can YOU imagine? Because nothing is Impossible, people! Dream BIG and Keep It Tight!